WAI offers lots of ways to promote your company on any budget. Start with a free company listing in the annual WJI Reference Guide and online Industry Search or submit a press release about your company, product, or service. Consider the additional opportunities below and see how your marketing message can be delivered cost effectively to WAI's international community. Summit one company profile, including key details about your products and services, and it will appear in print in the annual Reference Guide and also on WAI's dynamic online Industry Search. Listings are free and paid display advertising is also offered. 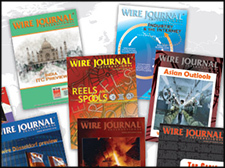 WJI editors regularly accept press releases for publication provided the content is newsworthy and appropriate for the wire and cable manufacturing audience. Send news about your company, a new product, or a personnel move within your organization. Press releases are free. WAI has print and electronic advertising options that will reach professionals in the international wire and cable industry at rates that satisfy every budget. WAI offers sponsorships at its annual trade shows, conferences, and regional chapter events. Opportunities vary by event and help marketers gain top-of-mind awareness with attendees. Ask your sales representative about the upcoming program. Hundreds of manufacturers and wire and cable industry suppliers participate at WAI’s annual trade exhibitions to promote products and services to the global marketplace. WAI offers exhibiting opportunities at its biennial Interwire and WAI Operations Summit & Wire Expo, and at its annual International Technical Conference. WAI invites authors and researchers to share technical and practical wire and cable manufacturing innovations at its next educational conference. The presentations help define the direction of the industry and the promotional exposure benefits the speaker and his or her company. Consider hosting a plant tour in conjunction with one of WAI’s events. Host companies receive added exposure about their products, services, innovations, and best practices. Tours are typically limited to a certain number of participants. Promotion and logistics are managed through WAI. WAI continually adds to its archive of educational wire and cable manufacturing videos, which are typically filmed on location. Videos illustrate best manufacturing processes at your plant and increase positive exposure for your company.